I bumped the "previously scheduled" FNB to report on this new recipe we tried last night. It is a definite make again...both G and R ate it up and were so busy chowing down they didn't notice the mushrooms (could be a first in our house!). R and I made it together in the morning and we all enjoyed playing in our backyard as it baked at dinner time. In a large nonstick pan, add the olive oil and heat to medium. Add the onion and mushrooms and cook for 5 minutes. Add the broccoli and ham and cook for an additional 3-4 minutes, or until the liquid has evaporated. Stir in the thyme, paprika, and pepper and remove from the heat. In a 9 x 13 pan coated with cooking spray, place four pieces of bread to cover the bottom. Layer half of the ham mixture on top, then 1/3 of the cheese, then 1/2 the ham and another 1/3 of the cheese (keep the remaining cheese for the very top). Place the remaining four pieces of bread on top so it looks like you made four "sandwiches" in the pan. Combine the milk and eggs and pour over the entire pan, making sure all the bread is covered. 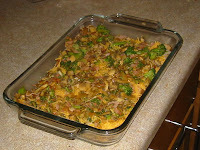 Chill overnight (if using as a breakfast dish) or at least 8 hours if making it for dinner. Once read to cook, preheat the oven to 375 degrees. Take the remaining shredded cheese and cover the bread. Cook for 45 minutes or until the eggs are no longer runny. Let set for about 10 minutes before cooking. 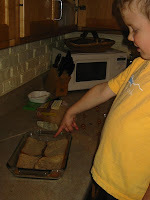 The ham and vegetable mixture goes on top: The egg mixture covers the sandwiches before it goes in the fridge: R loved how "poofy" the sandwiches were when they came out of the oven: The finished product: Certainly not a gourmet meal, but wow, was this yummy! Those look so good. We'll have to try them this week. This looks great. I was about to make it for tonight, but then realized the 8 hr/overnight issue... Will definitely make it next week!